On March 22, Commissioners Court failed to take meaningful action to support constituents concerned about the proposed Vulcan quarry. Instead, commissioners settled for passing the buck. Commissioners complained about their lack of authority, insisted their hands were tied, and seemingly ignored 30 minutes of pleas from citizens to draft an effective resolution requesting a contested case hearing as an affected party. Counties indeed should have more local control. But that’s a long-term solution that will not protect Comal County citizens from the negative impacts of this quarry. Until such legislation is enacted, requesting a contested case hearing is the best way the county can influence the decision on this permit—and commissioners certainly have the authority to do so. 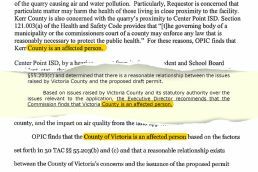 Both Kerr County (2008) and Victoria County (2016), requested contested case hearings on similar permits. TCEQ accepted the counties as “affected persons,” according to TAC Title 30, Section 55.203. In both cases, the permits were not granted, the applicants backed down, and the hearings were never needed. Commissioners: Your constituents are not asking you to write legislation, step outside your box of authority, or do anything unprecedented. Many other counties, including Kendall and Burnet (2017), have done this—often with positive results. This is the tool in your toolbox. At the March meeting, Commissioner Crownover lamented, “We don’t have any tools in the toolbox” and promised support should they find the tools. But as Representative Biedermann confirmed to Commissioners Haag and Eccleston at a Bar-W meeting, the county already has the ability to assist constituents in this fight. Indeed, Comal County possesses an effective tool: requesting a contested case hearing as an affected party. Time is running out. When will commissioners stop siding with an out-of-state corporation and begin using this tool to support the citizens they were elected to represent?